which flow is unimpeded is indicated by the fading of all sound in the artery, corresponding to the diastolic pressures. With the introduction of digital monitors, the popularity of aneroid monitors has declined. While traditional monitors are inexpensive, lightweight and portable, and require no batteries or other power source, practitioners must have some degree of training and achieve expertise in properly identifying subtle changes in heart sounds. In addition, personnel who are hearing-impaired may not be able to properly detect changes in heart sounds. 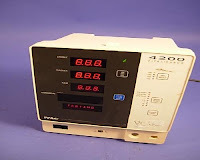 Meters must be occasionally calibrated to ensure the accuracy of readings, and bumping the meter can result in inaccurate readings. Digital monitors may feature manual or automatic inflation, although automatic inflation is increasingly common. Systolic and diastolic pressures are read from clear, legible electronic screens, making the monitors suitable for noisy environments or hearing-impaired practitioners. They are easy to use, with minimal training required. Digital monitors do not measure blood pressure directly but rather calculate it based on oscillometric detection but are nonetheless extremely accurate. Blood pressures may be read using portable digital monitors that are placed on a patient’s finger. These monitors are considerably less accurate than monitors that measure pressure in the arm, above the brachial artery. For home use, digital automatic monitors have a clear advantage, since they can be operated with one hand and require no training to use. However, digital automatic monitors have been growing in popularity for professional use as well. For hospitals and clinics, portable, pole-mounted and bedside blood pressure monitors are available. Pre-owned and refurbished, used blood pressure monitors may be purchased at costs that provide substantial savings versus new monitors.